The March Hare circuit is not so much of a kart track but more of a leisure venue with a kart track ‘bolted on’. 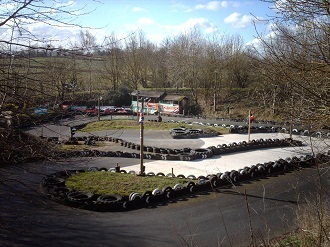 What we mean is that it isn’t the biggest circuit around but if you’re looking for a stag party venue that includes paintball, archery, shooting, off-road driving as well as some karting then this is the place for you. All karting events are listed below and our ‘Other Activites’ page, where you will be able to book online is coming soon, but in the meantime if you would like more information about what else is on offer please contact us. Head north on The Cross/A38 toward Angel Street and continue to follow A38. Take the first right onto Sansome Street/B4205 and continue onto City Walls Road/A38 then go through one roundabout then turn left onto Sidbury/A38/A44. Continue to follow A44 for just over one mile and at the roundabout, take the second exit onto Whittington Road/A44. After 04. miles at the roundabout, take the first exit onto Swinesherd Way/A4440 then at the next roundabout, take the thirrd exit onto A44. At the next roundabout, take the second exit onto A422, Mill Lane will be on the right. A one-hour practice session to improve your karting skills with medal for fastest driver. There is an outdoor track. The venue provides cooked meals and has a bar. There are conference facilities for 30 - 50.